Here is today's gym motivation. Think that getting in shape is just to hard to do and don't know where to start? 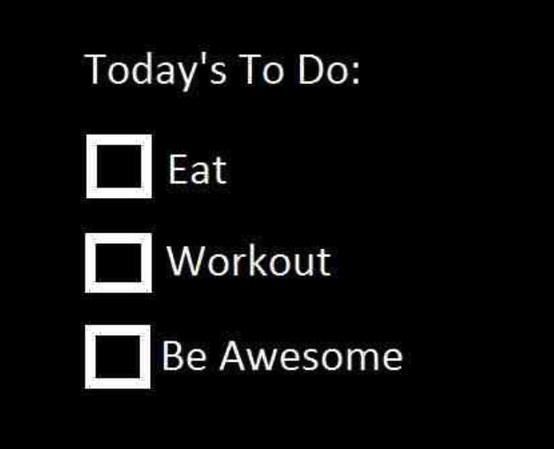 Well we break it down for you into three very simple and easy steps; Eat, Workout, Be Awesome. Then repeat. Getting healthy doesn't have to be boring, tedious, or complicated. Start with the basics and start eating right and moving more. What helps me to support my motivation is thinking how my shape is improving. To enhance my strength before workouts I am taking Navy Seal Formula, manufactured by MGNutritionals. This dietary supplement delivers perfect energy, so I am capable of training twice as long, and I see substantial increase in my strength and endurance.